The worst part of winter, in my opinion, is the tail end of the season in March (and sometimes early April). Everything's gray and beige and salt stained and potholed. 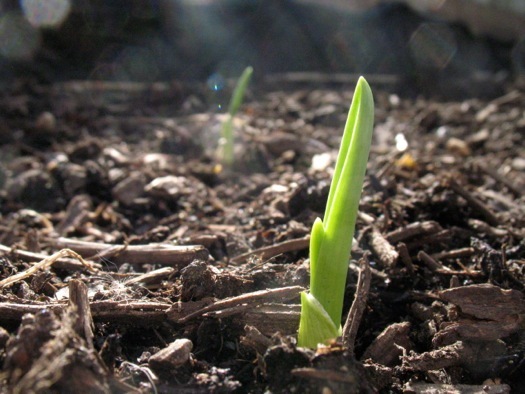 The snow is gone (usually), but the earth is only just beginning to stir. So the arrival of a seed catalog is like seeing the top of a crocus poke through the ground. It's a sign that, yes, the season really is changing. Paging through a seed catalog is a virtual walk through the verdant and ripe shades of spring and summer. There's a certain calm, meditative quality about this act. Open the catalog. Flip through some pages. Study the differences in the varieties of green beens. Take a sip of tea. Flip a few more pages. 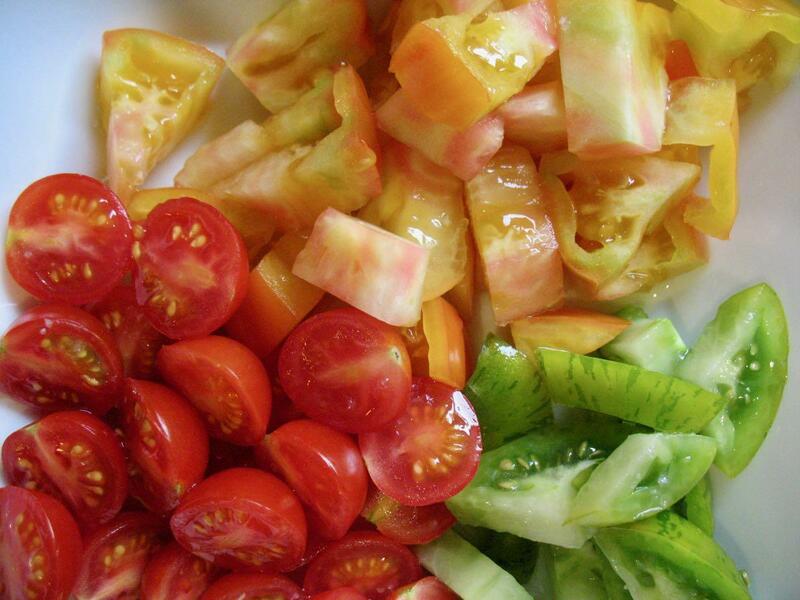 Imagine the sweet acidity of all those juicy tomatoes. Flip a few more pages. Gawk at all the sunflowers. Flip. Study. Flip. Sip. Flip. Study. Modern agriculture is super productive. Its products are also, somehow, often remarkably boring. Walk into a supermarket and you'll be presented with a bounty that would have been almost unbelievable to people just a few generations ago. But one of the tradeoffs for that abundance is that everything in the store needs to fit neatly into some box, literal or figurative. Apples are a good example. How many varieties are there typically in a supermarket produce section. Maybe six? Seven or eight if you're lucky? Yet there's a whole world of different and strange apples out there. The sweet potato page from this year's Burpee catalog. And it's not just apples! I'm continually delighted by the wide variety of all sorts of produce staples that are represented in most seed catalogs. Even the Burpee catalog -- more a record of modern hybrids than old heirlooms -- features a remarkable range of options. 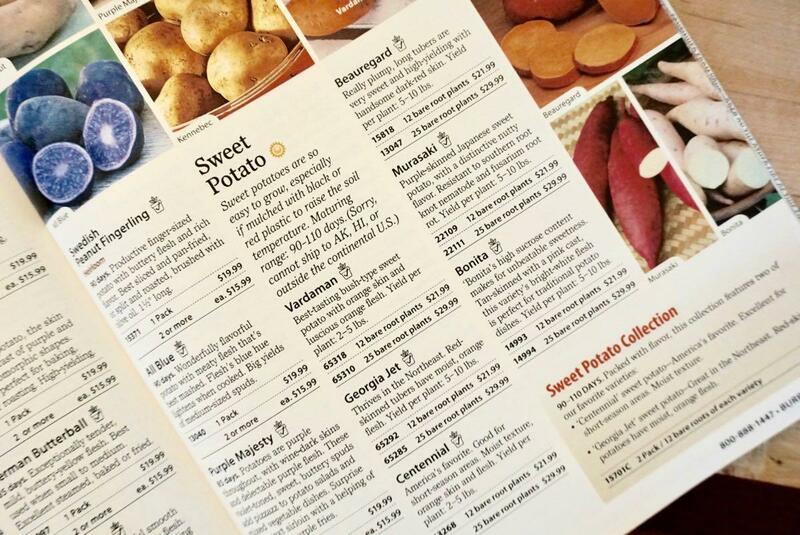 Just now I randomly opened that catalog to the potato page -- and it includes six different types of sweet potato, ranging in color from garnet to orange to white! Picking through these varied options is mind expanding. Who knew there were so many types of carrot? And there are yellow cucumbers! And watermelons with orange flesh! And a rainbow of peppers, hot and sweet! And the tomatoes. The tomatoes. You could spend days studying all the varieties of tomatoes, the different colors, shapes, uses, names, origins, and backstories. 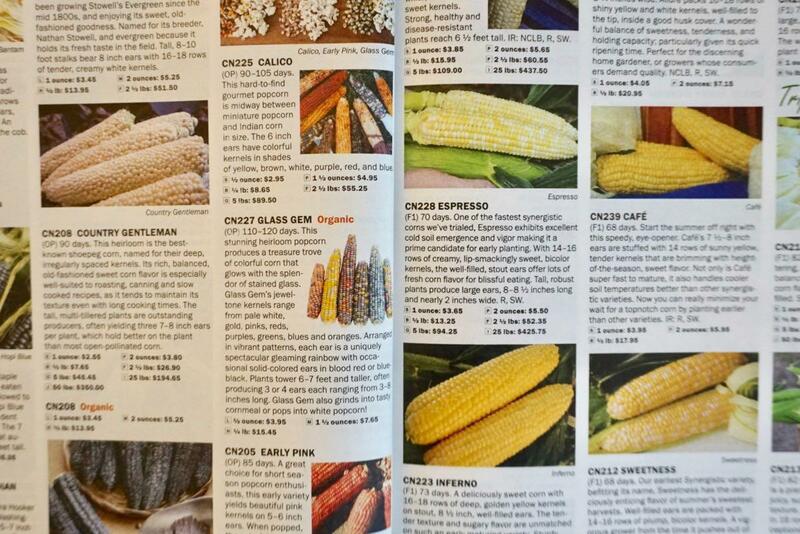 Some of the corn varieties in the Territorial Seed catalog. This enchanting variety is a testament to the beauty and weirdness of the natural world -- and a monument to the ingenuity of humans. Many of these varieties didn't just spring into existence. There were carefully bred and coaxed into their current form by generations of people, dating back thousands of years. That there are literally pages of different sorts of corn is a modern tribute to how people in Central America 10,000 years ago pulled off one of the greatest feats of biological engineering in the history of the world, turning what was essentially grass into an agricultural foundation for civilizations. So if all this variety exists, we should enjoy it and help keep it going. That's why I'm a big fan of growing at least one or two unusual varieties in the backyard each summer. One year it was Mexican sour gherkins from the Hudson Valley Seed Company (they just about took over one of the garden boxes). Another year it was the sunchocola cherry tomato (one of my favorites now). Last year it was lemon cukes (pretty good!). This year I'm trying the not-hot habanero -- habanada (get it) -- and Badger Flame beets from that new Row 7 Seed Company. On some fundamental level what seed catalogs are really selling is a chance to be optimistic. I can order these seeds from some far away place, put them in the ground in my backyard, grow the plants, and then eat the produce. A bunch of things have to work out for that tomato to end up on my plate. Taking the chance on it is an act of optimism. And that's one of the things I've really come to appreciate about gardening. It forces you to plan ahead, nurture something outside yourself, to have hope for the future. The world could use more of all those practices. It could also use more backyard tomatoes -- whatever the type. Because knowing you grew that tomato yourself will make it taste even sweeter. If you think you might like to grow something this year, it doesn't have to be a whole big deal. It doesn't even necessarily require a garden. 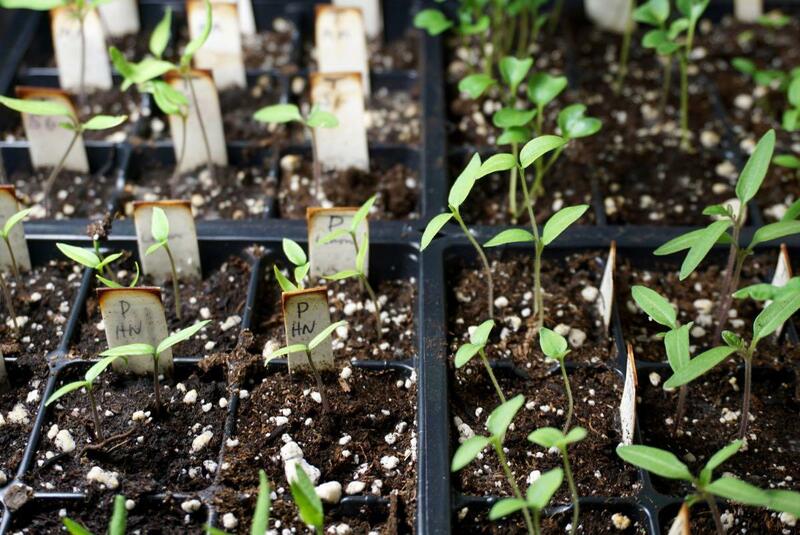 You can start a few seeds in paper cups on the window sill. Hardware stores, garden stores, and even places like Honest Weight have all sorts of seeds right now, along with bags of seed starting soil. (Honest Weight has a lot of heirloom variety seeds.) Seeds are cheap. Most packets are no more than $2 or $3 -- and you'll often be able to use the seeds for multiple years. Flowers and herbs are a good choice because you can plant many varieties in pots (check on the seed packet). A handful of marigold seeds will sprout quickly in a sunny window. Transplanted to a pot they'll bloom pretty much the whole summer. But you can also grow tomatoes and other veg in one of those five-gallon buckets from the hardware store. One year I even grew a few tomato plants upside down. Of course, having some garden space will help you branch out. 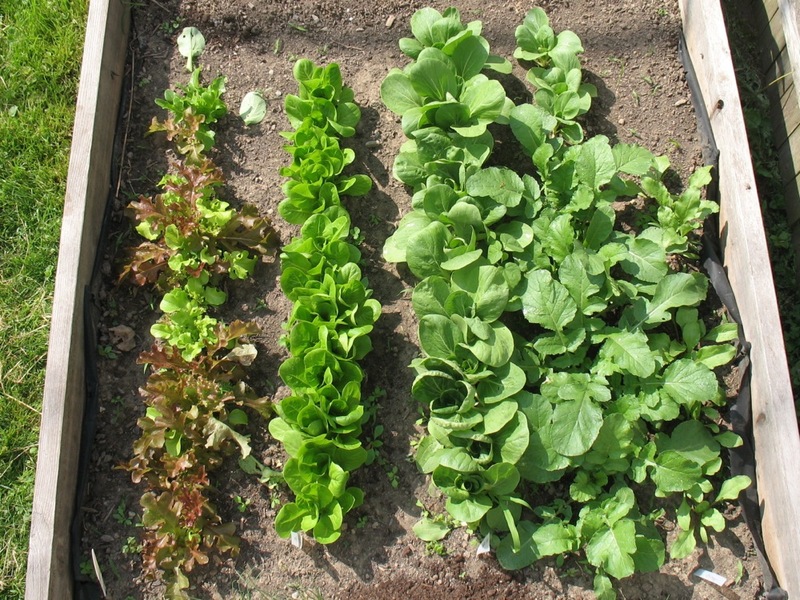 If you don't have room where you're living, you might think about scoring a plot in one of the many Capital Roots community gardens (don't wait to sign up). Also keep an eye out for classes the org offers. And if you'd rather buy seedlings, that's great, too. There will be many places selling them a little later in the spring. If you're looking for good plants at good prices, a bunch of local organizations have plant sales in May -- that link is last year's list, which we'll update as May approaches. Order something from Fedco Seeds (Maine) so that they send you their catalogue. It is the finest seed catalogue known to man for a whole bunch of reasons. Also, doubles as a coloring book for kids. Their product is outstanding too. Love this...my mom had an amazing vegetable garden for years when I was a kid and I remember her excitement when she got seed catalogs in the spring (back before Burpee was all hybrids). I second Fedco--very cool catalogs! AOA needs more articles like this. Thank you. Great essay, Greg. I agree about trying new vegetables or varieties if you've got the room. For me this year it'll be okra. I don't even like okra, but it's a beautiful ornamental plant. Also, color, color, color: if any vegetable comes in a purple variety, I'm going to grow it. Ditto for striped tomatoes, orange cauliflower, pink daikon, rainbow chard. It's my chance to be an artist in the garden. Report back to us later in the summer about that heatless habanada. I'm interested in growing that in the future. 1,000% accurate. something about an actual catalogue that is so much better than browsing on-line. Perhaps it physically arriving during the bleakness of the seasonal transition that gives it some special meaning. On a related, unrelated note, any good sources for heirloom tomato plants locally? Cosigning this entire post. 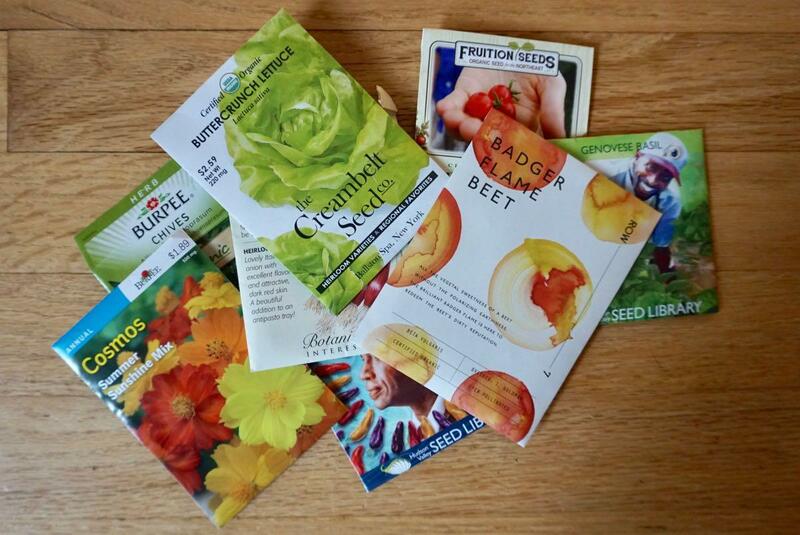 I am currently limited to receiving the Hudson Valley Seed Catalog and Baker Creek because every year in March I try and buy my way out of the winter doldrums with seeds. I should note, once the plants go in the ground I'm a fairly lazy gardener so do try to limit myself to less fussy, northeast reliables (Thank you HVSC!). I'm also planting the HVSC Mexican Sour Gherkins this year! Baker Creek has some insane multicolored tomatoes but I passed (for now) to focus on tomatoes I've had success with before. Could we do an end of season garden wrap up? Something along the lines of "My favorite thing I grew this year"? I'm always interested in hearing what other local gardeners have had success with. For me last year it was Snowball tomatoes- they just kept pumping out no matter how changeable the weather was. My biggest garden fail was losing all of my peas and beans to a small creature before I could harvest. My go-to source for heirloom seeds is the Seed Savers Exchange...not local but lots of great varieties. Thanks for this great post! I was just planning new flower garden beds last night so I am right with you! A question for you and other local gardeners....I'm new to Upstate and will be installing raised veggie garden beds this summer. Bunny sightings are a regular occurrence in our yard in Albany. How do folks keep rabbits out of their garden? I'm assuming we'll need to install some kind of fencing around each bed. Any recommendations on specific types of fencing or other methods to keep them out? I save my catalogs for dreary days just to look at the pictures! I don't start seeds as my cats play with the soil and would eat anything sprouting...too much of a hassle. jsc asked earlier of any local plant sources for heirlooms...I don't know if there are heirlooms mixed in but Honest Weight has a very good selection of organic vegis and herbs which is where I get mine. Always great quality plants (perennials too)! AJ asked about what fencing to use with their raised beds...I think it depends on the height of the boxes and how they are grouped (one big fence around them all or little fence sections within the raised beds). Gardener's Supply has good ideas and a section on how to plan your gardens along with companion plant suggestions, etc. Good resource! @Dave, Rebecca: I've bought a few different Fedco seeds at the co-op, so never gotten the catalog. 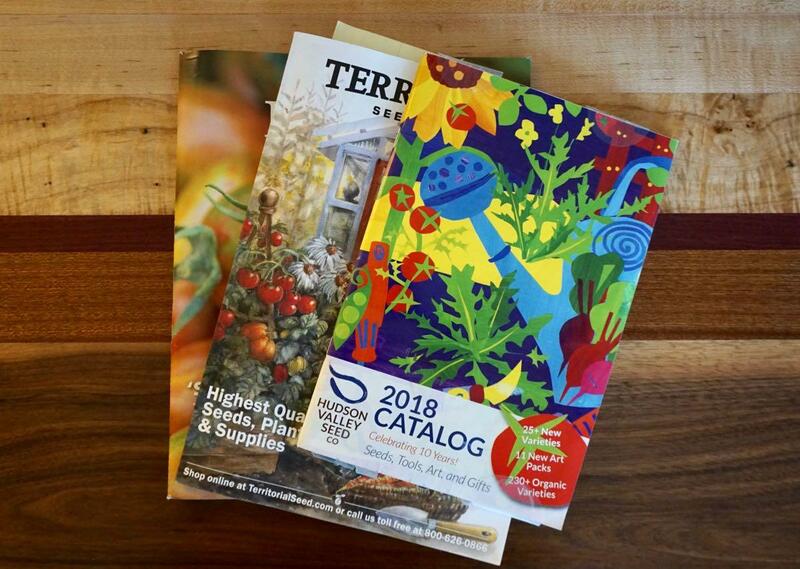 Now I'm feeling seed catalog FOMO. @chrisck: Yes, about different colors, so much. I had to really fight the urge this year to grow purple tomatillos because we just don't have the room. (But... they're purple.) Will let you know about the habanada. @jsc: I've seen a bunch of heirloom tomato plants at the annual plant sale that the Cornell Cooperative Extension has in Voorheesville. @Cmaxby: The Atomic Grape Tomatoes, right? Oh, man, I wanted try those so badly, but didn't want to kick out old favorites. And garden report sounds fun. @Justin: And Seed Savers has a good catalog. @AJ: I haven't really encountered too many problems with rabbits -- except for the time I found a group of baby rabbits bedding down in the straw for the garlic. But a neighbor had some issues and just put some chicken around their garden and that seemed to work. I'm newly obsessed with the Baker Creek catalogue. This year I'm tackling multiple varieties of hot peppers - Brazilian starfish, white habaneros, something called the fish pepper! I am determined to prove at least one of my thumbs is green (ish). @jsc and Laura- Honest Weight sells lots of heirloom tomato varieties and they're organic. It's nice that they sell them as single plants, so you can get a variety and the right amount for whatever space you have. @AJ - I have chicken wire around my raised bed and it works great to keep the bunnies out but the chipmunks go under it. I've read you have to put the fencing 2 feet down into the ground to keep them out. The little b@$+@rd$ like to take one bite from each tomato, just before it becomes ripe enough to pick. Regarding sources for heirloom tomato plants, Gade Farm in Guilderland usually has some Brandywine seedlings and a few others. They also have Sungold or Sunsugar seedlings which are the BEST TOMATOES EVER. The biggest selection of heirlooms is as at Faddegon's but the plants are super duper expensive, like $4 each. The yield from the plant doesn't justify the price of a seedling, it's how expensive it is.